Every year, thousands of snowbirds travel to the southwest looking for Arizona mobile homes for sale. The reason: Arizona’s beautiful desert weather and landscape. There is no better way to take in Arizona’s natural beauty than at one of its 22 breathtaking national parks. 1. Grand Canyon National Park: Arizona’s most famous national park is immense and awe-inspiring. The uniquely eroded canyon is 277 river miles long, 18 miles wide, and a mile deep. Visit the more popular South Rim, less popular North Rim, or explore the Grand Canyon from within – on a raft tour down the Colorado River! 2. 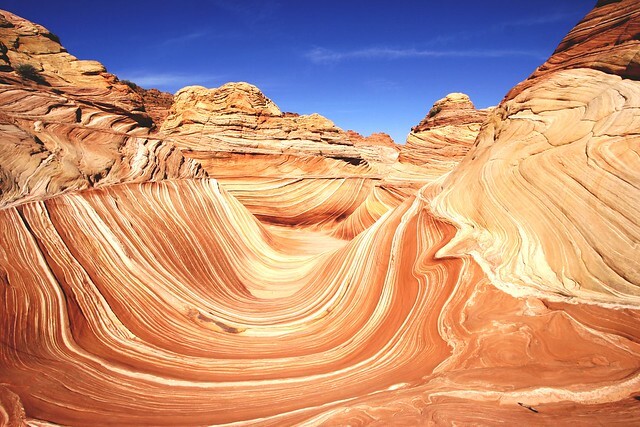 Vermilion Cliffs National Monument: Located north of Grand Canyon National Park, this 280,000 acre monument is home to one of the most unique geological formations; The Wave. There are no roads and few trails in this remote region; so to fully experience The Wave you will need some luck in the backcountry permit lottery. Only 20 passes are given out each day to this breathtaking rock formation so try and plan ahead. 3. Petrified Forest National Park: Long before Arizona was the arid desert it is today, it was a humid, subtropical rainforest. This period is frozen in time at the Petrified Forest National Park where trees, plants, reptiles, and dinosaurs are all preserved in sediment and volcanic ash. What makes the Petrified Forest so spectacular is the way in which these Late Triassic trees were preserved. Over the years, groundwater dissolved silica from the volcanic ash and carried it into the logs where it formed quartz crystals that gradually replaced the organic matter. Enjoy the beautiful Painted Desert landscape and walk the half-mile Giant Logs trail to see some of the largest and best preserved trees in the park. Enjoy the beautiful fossils and petrified trees but remember it is a federal offense to remove any material from the park! 4. Saguaro National Park: The saguaro cactus has become emblematic of the American southwest but in reality only exists in a small portion of southern Arizona. These colossal cacti grow centimeters a year, reaching heights of up to 70 feet and living for more than 250 years. Hundreds of these giants are protected at the Saguaro National Park on the east and west outskirts of Tucson, making lodging accommodations a breeze. 5. Glen Canyon National Recreation Area: Home to the 186 mile Lake Powell, the Glen Canyon National Recreation Area is one of the best spots for fishing and water sports in Arizona. Houseboat rentals, campgrounds, and nearby hotels are all options for overnight stays. In addition to boating, jet skis, kayaking, and fishing; the Glen Canyon area also boasts the scenic Lake Powell Golf Course. These five beautiful natural parks and many more await you only a short trip from Arizona mobile homes for rent.